What if babies were allowed to be bought and sold on the free market? Child protection laws would still be in order; we're not talking about a slave market here. But, if you could start getting $10,000 per illegitimate child, I think you would start to see a shrinking abortion rate in America. And doesn't that seem to be where free market capitalism is at it's best, enforcing morality by creating custom-ordered kiddies? Adoption is already extremely expensive, but that money obviously doesn't go to the parents of the child. To add $10K to the cost would severely reduce adoption. Do you want to government to fund this thing? You'd also see a whole new accupation. Babymaker. this idea would be the exact opposite, getting the red tape out of the event. Get rid of the federal agencies. Create a private free market, an e-bay for children. 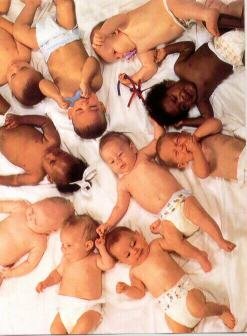 I find it hard to believe there is enough demand for the supply of babies. Babies would go cheap. Perhaps, but people are paying $10K for babies right now, only through an adoption agency. if only babies could be put to work, then maybe they would be worth something. Kat and I were riding our bikes around the neighborhood the other night and we saw an 8 year-old mowing the lawn, and I realized that there are those clever enough to have gotten around the child-labor laws after all. Would certain babies cost more than others? Maybe its just because I was just on an NBA Web site, but I'm now imagining a baby draft, with Stuart Scott talking about how hard it must be for the final two-month-old left in the green room. oh heck yeah, no baby socialism here. This is where the free market works, that pitt-jolie baby could go for $200,000 or so. Think of it like buying a racehorse...exactly like it.